Tommy Ford from the riotous "Martin" TV series hosts this hilarious comedy special featuring four of the funniest Gospel comedians from BET's "Comic View." According to these observant Christians, the most humorous things happen in church, and they're here to tell it like it is. Join Chocolate, Chucky Jenkins, Small Frie, and Darian Perkins for a set that will have everyone rolling in the aisles. 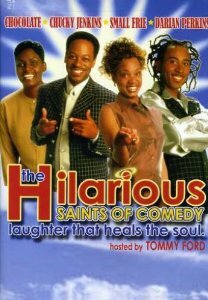 AKA: "The Kingdom Comedy Tour: Laughter That Will Heal Your Soul." 85 min. Standard; Soundtrack: English Dolby Digital stereo.